Stroke!! A life threatening medical condition which occurs due to the sudden loss of brain function when blood flow to the brain is interrupted. The condition includes the sudden onset of various symptoms like difficulty in speaking, exhausted face or slurred speech, being off balance, weakness in a limb, visual loss or a really severe headache. Every year, around 1, 10,000 people suffer from stroke in England, which is said to be the third largest cause of death, after heart disease and cancer. Around 1 in every 4 people who has a stroke will die and those who survive are often left with long-term problems ensuing from the injury to their brain. Three quarters of hospitals do not have enough doctors to care for those patients admitted to hospitals at weekends after suffering a stroke, a national report has found. Lack of round-the-clock care consigning too many stroke patients to lifetime disability, said Jon Barrick, the chief executive of the Stroke Association. The new audit, which covered more than 74,000 patients in England, Wales and Northern Ireland, found widespread shortages of nurses and doctors. So, why there has been no improvement in death or re-hospitalization rates of stroke patients? A neurologist says, if he gets a stroke victim within 3 hours, the effects of stroke can be totally reversed through early medication. However, the current scenario involves the queued up process for the treatment of patient suffering from stroke attack. Initially, he has to wait for an arriving ambulance, which is then followed by completing the formalities as asked by the hospital management. The patient is then moved to the treatment area upon the completion of former processes. Such time taking procedures adversely affects in worsening patient’s condition. As technology improves every day, the advancements in treatments and breakthroughs in information have served medical sector with new tools to practice medicine. Google Glass is a headset which includes a tiny camera that can be worn like a pair of eyeglasses. It has small prism-like screen inserted into the upper corner of the frame that keeps the wearer constantly plugged into the emails, calls and other notifications in real time via Internet. By using this technology, medical responder, at sites of emergencies, is able to live stream the status of the patients and the associated trauma to the physicians in hospitals so that they can get prepared for an emergency treatment once the patient reaches the hospital. Generally physicians have to spend hours on patients’ health records and documentation. With the help of Google Glass app, they can access important information of patients in real time without being tethered to a computer. Doctors can always maintain a direct contact with their patients while the conversations are securely recorded along with the visual information. The use of Google glass allows Emergency Medical technicians stream images and videos of the stroke patients to the room physicians so they can examine the trauma before arrival. Doctor can further offer advice and treatment options to the EMTs which ensure better recoveries and reducing long term disabilities. At the end, all that matters for doctors is their patients’ satisfaction. 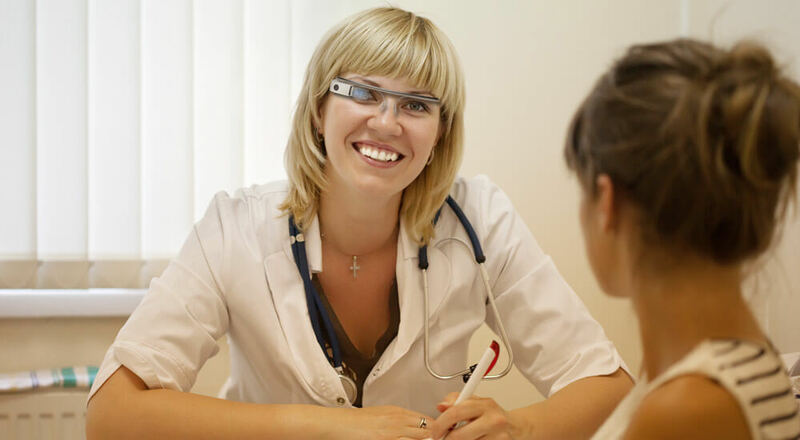 With Google-Glass, patients are able to get superior treatment from the comfort of their homes. The recorded medical records and instructions eradicate all the chances of forgetting instructions or reminding incorrectly. Google Glass also assures that proper processes should be followed and communications should be conducted in accordance with the hospital policies and government regulations, thereby shaping the future of healthcare landscape. Google Glass is an emerging technical innovation that has paved the way for truly remarkable journey within healthcare by improving the delivery of care along with the overall quality and patient experience.